Sometimes, a monitor’s built-in stand is just not good enough. Maybe you need extra elevation or extra adjustability in order to make your gaming sessions truly comfortable. 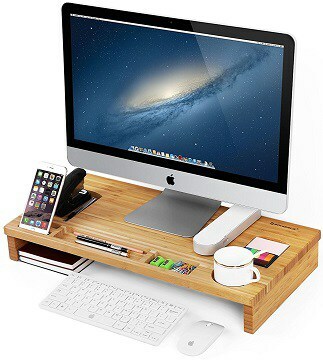 Or, perhaps, all you need is some more desk space. In any of those cases, a monitor stand might be a good solution to your problem. In this article, we’re bringing you a selection of the very best monitor stands of 2019! Below, you will find everything, from simple desktop stands to the more complex ones that come equipped with VESA mounts. As the name so obviously states, these are the monitor stands which are designed to be placed on top of a desk. 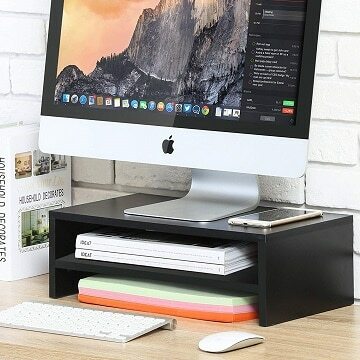 Usually, they also incorporate some extra features that are meant to improve desk organization and save space, such as additional shelves and/or storage compartments. 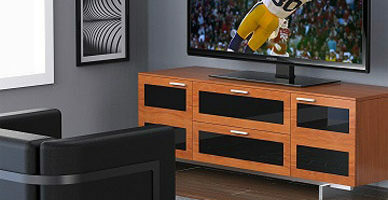 Fitueyes is a company that more-or-less specializes in stands, be they stands for monitors, TVs, or universal ones. As such, it is no wonder that their products have found their way on this list. This first monitor stand is a simple, no-frills stand made of wood, with a neutral matte black finish. It also comes in two variants: with or without a shelf. 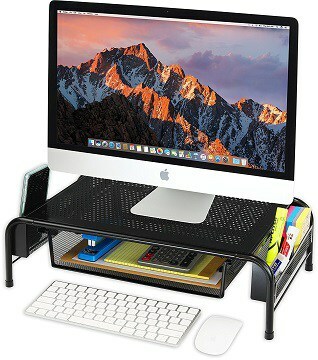 Needless to say, the latter is a better choice if you need extra storage space on your desk. All in all, this is a simple, affordable monitor stand whose primary strength is simplicity. While we find there to be no fault with the stand itself, we’re sure some people would appreciate a greater variety of colors to go along with certain desk veneers, but unfortunately, this stand is available only in black. For those who don’t really like the above stand’s black finish, Fitueyes has an alternative that might be preferable: glass. This stand consists of a fairly thick tempered glass pane that’s set on four silver legs. Now, not only does this mean a smaller footprint, but the legs’ height is also adjustable. Furthermore, while there are no variants that include shelves this time around, this stand is available in two versions that differ primarily in width: a 15-inch one and a 20-inch one. There are no big issues with the stand itself, although if you plan on taking advantage of the adjustable legs, it might be a bit of a hassle to get the stand to be completely level. If neither wood nor glass suits your tastes, then Halter’s LZ-500 metal monitor stand might be a better fit. It is an elegant black stand with two shelves and some extra space underneath. 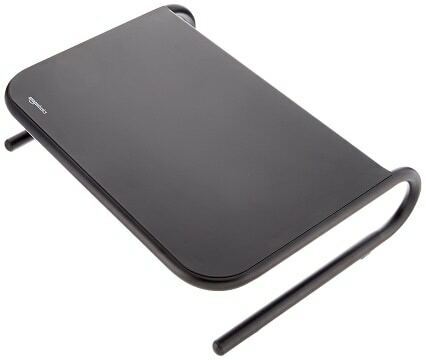 There are no standout features to the stand other than its excellent build quality. This might be either a good or a bad thing based on what you’re looking for. If all you need is a plain monitor stand with good build quality, then this one might be ideal. On the other hand, it offers no extra features for that extra cash, so those who aren’t overly concerned with the build quality might not find it a worthwhile investment. Next up, we have a similar monitor stand, although this one is more oriented towards storage capacity rather than sheer aesthetics or build quality. The SimpleHouseware monitor stand has a spacious top shelf, but also has three additional compartments: one on the underside and two smaller ones on either side. These can be great if you need to organize a bunch of smaller items on your desk, even if they’re not necessarily office accessories. The only thing that’s slightly lacking in this product is the build quality, as it doesn’t feel quite as solid or as stable as other metal stands. And now, we have a very basic but a very well-built solution from AmazonBasics. Their stand is reminiscent of the Halter LZ-500 in terms of appearance, as it is also a black metal stand utilizing a similar design. However, since it is not vented, it boasts a much cleaner and more minimal appearance than its Halter-made counterpart, and it also lacks the extra shelf space. However, the AmazonBasics monitor stand more than makes up for it with sheer build quality. While there are no glaring flaws to the stand itself, some will undoubtedly feel that the build quality in itself does not justify the price, especially when there are similarly-priced stands out there that throw in some convenient extra features. Even though it’s coming from the same brand and at a similar price tag, the AmazonBasics adjustable stand’s primary strength is just what the name states: adjustability. Instead of metal, it is made of black plastic which, while it doesn’t exactly feel cheap, is still a far cry from the firmness and the visual appeal of a metal stand. The stand’s main selling point, as mentioned above, is the adjustability that comes in the form of detachable legs, making for a total of 3 height adjustment options. There are no inherent flaws with this stand, but as you might have guessed, the plastic build, as sturdy as it is, may leave some people wanting, especially when there are stands in this price range that come with all-metal builds. With the Songmics stand, we take a break from all the dark stands out there, as this one sports a much more aesthetically pleasing bamboo texture. Apart from the looks, the Songmics stand also has several indents and slots that are intended to help with organizing your desk. This is a great way to reduce desktop clutter, and is bound to appeal to those with particularly messy desks. However, all these indents can really detract from the stand’s overall aesthetic appeal if you have nothing to actually keep in them. In such a case, they just become unsightly blemishes on the otherwise beautiful bamboo surface. The second category consists of, as the name once again gives away, stands that incorporate VESA mounts into their design. 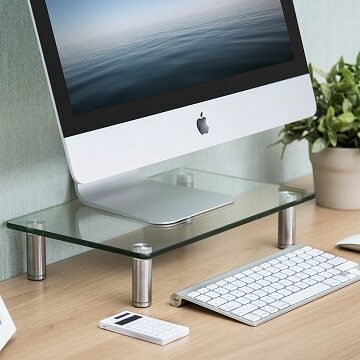 Most of them attach to the side of a desk with the help of a clamp, thus saving space, but the great degree of adjustability that they offer is their primary advantage over regular desktop stands. This basic version uses a clamp to attach to the edge of the desk. 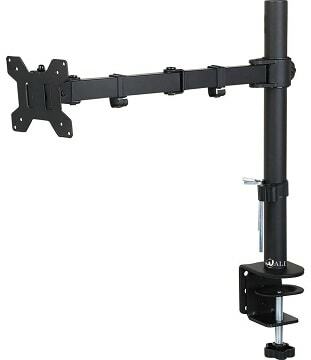 The VESA mount is attached to an arm lined with cable management pins, and this arm is further attached to a fixed vertical pole. 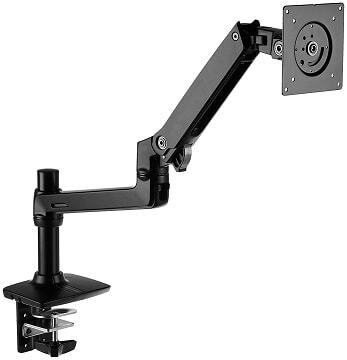 Just like the above version, a clamp is used to secure the mount to the desk, although this variant is a bit more elegant when it comes to handling the appearance of the arm, as well as the cable management (see picture below). A wall-mounted version is available as well. Finally, there is the simple free standing version which is placed on top of a desk, just like a regular stand. The actual stand of this version is not the best-looking one around, and the mount, while lacking an arm, is still highly adjustable. Each version supports 75x75mm and 100x100mm VESA patterns, which is the standard for monitors. 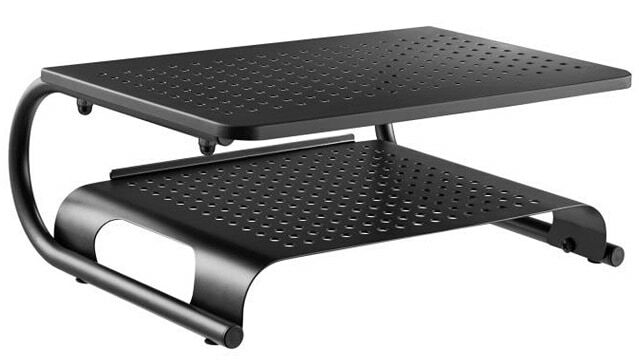 All in all, for a fairly modest price, each of the above Wali stands is a highly-adjustable, well-built monitor stand. The only problem some might find is that each version does have minor caveats when it comes to aesthetics, but that is easily overlooked when you consider just how great of a value these mounts present. 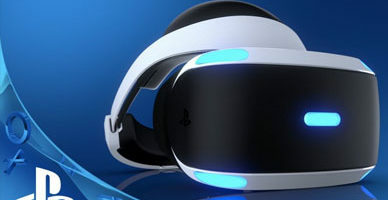 The following products from Vivo are similar to the above solutions from Wali, although they differ in the fact that they are designed specifically for dual-monitor setups. The Regular Desk Mount – As before, this version uses a clamp to attach to the side of a desk. The Tall Desk Mount – Different only in the fact that it is quite a bit taller than the regular version. The Free-Standing Mount – Once again, this is the version designed to be placed on top of a desk. Vivo’s mounts are remarkably inexpensive, with the exception of the tall variant. With that in mind, the build quality does suffer a tiny bit, as the arms are not as stable as you’d expect from some of the more premium-quality mounts. Regardless, this is still a very good deal if you have a dual-monitor setup. And finally, we have another set of products from AmazonBasics, although these few stands are far from basic. This premium monitor stand comes both in a single-monitor and a dual-monitor variant, both of which are secured to a desk via a clamp. Furthermore, just like the two products above, they support 75x75mm and 100x100mm VESA patterns. However, the first thing you’ll notice that sets these AmazonBasics stands apart from both the Wali and the Vivo ones described above, is their superior build quality, although this also means a noticeably higher price tag. 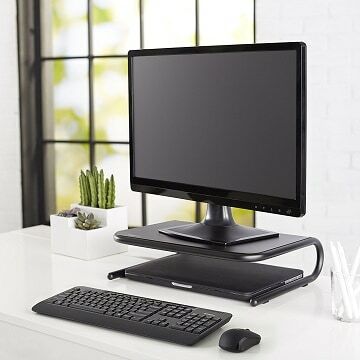 The AmazonBasics Premium monitor stands are slightly more adjustable, better-built, and incorporate quality plastic into their design as a means of achieving a cleaner, more aesthetic look, and they take a more discreet approach to cable management. 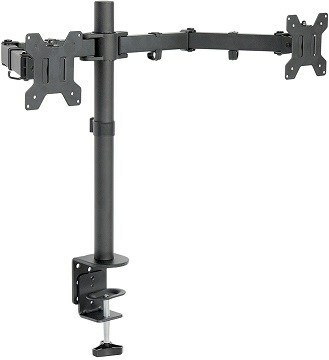 All in all, if you want a quality monitor stand with a VESA mount, this would be the way to go. However, if you feel that the sheer build quality or the retractable arm don’t justify the high price tag, you’d be better off just getting either of the above two stands. Desktop vs Mount – Which To Pick? The first choice that you have to make before deciding on which stand to get is choosing between desktop stands and stands equipped with VESA mounts. Now, there are two most important factors to keep in mind: affordability and adjustability. Mount-equipped stands offer two distinct advantages: they are more adjustable and they save more desk space (the latter applies assuming that you go with a clamp-equipped one). The adjustability, however, is the most important thing to consider. If you have trouble getting comfortable or if you might want to view your monitor from different angles, mounted is the way to go. Desktop stands are, for the most part, cheaper. Not only that, but they also tend to be more inconspicuous and, as you can see, some come with extra features that can really help with organizing one’s desk. 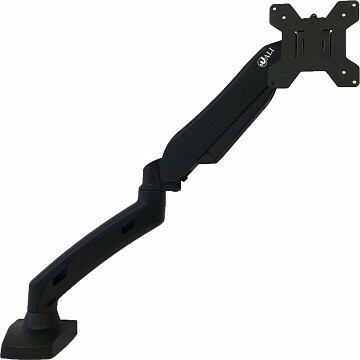 So, all in all, our advice is going with a mount if you want to have your monitor be as adjustable as possible. If that is not something you concern yourself with, then a simple desktop stand might be a better way to elevate your monitor, free up desk space, and even organize your desk better. If we had to pick out one single monitor stand that would be our stand of choice, then we’d have to go with the AmazonBasics Monitor Stand. As you can tell from the list, these products are quite varied, both in terms of appearance and functionality. With that diversity in mind, it’s not easy singling out just one stand, but the AmazonBasics stand remains our top pick simply because of its no-frills approach and great build quality. But of course, that is only our choice! Maybe you need a monitor stand that blends better with your desk, maybe you want one with more storage space, or maybe you’d prefer a highly adjustable one with a VESA mount. Whatever the case, any of the monitor stands listed here will surely make for an excellent purchase, provided that you keep your own needs, as well as a stand’s own shortcomings, in mind.